Filmmaker Christopher Nolan (The Dark Knight Trilogy, Inception) gathered together director Michael Mann, stars Robert De Niro and Al Pacino (to name a few — a bunch of the key cast and crew were in attendance) for a special Q&A screening of the 1995 crime epic Heat, for a belated 20th Anniversary and a showcase of its new 4K print. It's been a long time since I cried myself to sleep for missing a film, but let me tell you not being there may go down as one of the great regrets of this film geek's life. Thankfully, the folks at indiwire got their hands on some select conversations from the Q&A with those key players (and more). It is extremely surprising to say that bombs were dropped. Al Pacino, when discussing his portrayal as Vincent Hannah, revealed that he and Mann had constructed Hannah as a cocaine addict. They never wanted to show it on screen, but his portrayal is informed by this decision. This begs a serious question; would you be able to go back and reappraise Pacino's performance based on this new information? The answer is; yes. However, does it add any more value to the performance? One would argue vehemently, no. Vincent Hannah is one of this reviewer's favourite characters ever to appear on screen. He's verbose, clinical, assertive and so disarmingly unpredictable to the criminals that he interacts with that it appears Pacino is having his way with the performance. To this reviewer, it's necessary to maintaining dominance as a guy of diminutive stature to keep dangerous criminal informants like Hugh Benny (Henry Rollins) or smug arseholes that you're about make criminal informants like Alan Marciano (Hank Azaria). Could the character be a guy getting on in years that self medicates with a stimulant like coke to live the 24/7 live that fuels his team? Yes. Could that be an affectation of desperation that he's beginning to lose his edge? Yes. Does it make sense for a guy that's on "the downslope of a marriage" for a third time to be resorting to narcotics to attempt to be on deck for all the things he's doing in his life? Yes. Was this an important mechanism or shortcut for director Michael Mann and Pacino to apply to their collaboration on the character to get the character to the screen? Yes (watch the clip yourself to see how specifically Mann frames it). One wonders if Pacino, after more than 20 years with the film has begun a process of begging forgiveness for a performance that was criticised? Now that seems like a distinct possibility. Sometimes when you get insights into a filmmaker's intent, your viewing experience is broadened and enriched. For example, in the wonderful documentary Hitchcock/Truffaut (2015), Hitch reveals that his choice of lighting, framing, colour and the translucent superimposed images in Vertigo as 'Scottie' Ferguson (James Stewart) is able to recreate this dream woman in Kim Novak; he wanted the audience unconsciously to feel like it was a form of necrophilia. You can hear about Kurt Russell trying to give Jack Burton a John Wayne cadence in Big Trouble in Little China without you righting it off as an impression. Mann talks about it happening in the periphery of the film, never wanting to jeopardise the audience's perception. 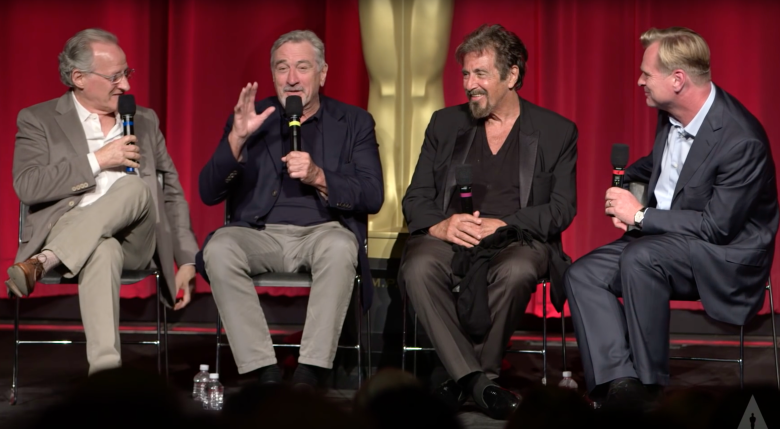 Conversely when De Niro is asked about what he remembers about the shoot is that Mann created an environment that made it easy for him to do his work and bring this elemental, archetype to life effortlessly. Pacino's opportunity to excuse the elements of his performance that he doesn't like when he reflects upon it gives an insight into something that doesn't make the performance better; instead it probably reflects Mann's awareness as a performance crafter to use shorthand that his actor could relate to, to get the performance he envisaged. Revelations don't change the performance a single beat. If anything, it diminishes and medicates a character who used manic behaviours as weaponised disorientation. This is the perfect time to stick your fingers in your ears, close your eyes and starting shouting "la la la la la." Pacino, like De Niro's MCCauley said before me; 'I told you I was never going back."